Career fairs have always been a staple of professional-development opportunities hosted by undergraduate institutions across the United States. These events serve as ways to connect undergraduate students with companies within their industries of interest, ranging anywhere from computer science to investment banking. The fairs also provide a valuable chance for students to develop resumes, perfect their elevator pitches, and effectively communicate with professionals. However, the practice has become outdated and inefficient given the concurrent growth in popularity of networking platforms, online application systems and over-enrollment of undergraduate students at UC San Diego. In today’s advancing technological society, it’s no surprise that the majority of industry interactions and job searches occur online. LinkedIn, a popular networking platform among college graduates, boasts over 467 million users, and is utilized by job seekers and recruiters alike. Job postings can be found painlessly either on the company’s website or on secondary sites like Glassdoor, which allow prospective employees to find statistics like average salaries, ratings, and overall reviews of the company before applying. Many companies have adjusted their hiring processes to reflect this technological growth. In 2016, over 84 percent of companies were recruiting online alone, in contrast to just 56 percent in 2011. Many recruiting offices have also turned to online applications chock-full with screener questions to weed out under-qualified applicants, streamlining the hiring process. Given the accessibility of companies via the internet, standing in line for upward of an hour for a couple minutes of face time with a recruiter quickly becomes unappealing. Although career fairs provide an opportunity for students to survey different industries and ask questions about professional life, much of the information shared can be found on the company’s website or third-party sites. The fairs have become outdated methods of job-searching and must offer a higher payoff in order to appeal to undergraduate students given the current state of employment searches. UCSD’s undergraduate enrollment reaches over 25,000 students, and consequently, involvement in student organizations and events has increased. Career fairs are no different: depending on the organization and companies present, the events are usually packed, with lines ranging from 20 minutes to an hour long. These wait times can add up quickly, especially given the fact that the actual exchange with an industry representative usually only lasts five minutes. Depending on the event attendance by students and companies, an undergraduate could very possibly spend an entire day at the career fair, and even without any payoff. Many recruiters refuse to hire on the spot, and usually point students toward their online application, which could have very easily been found without attending the event. Although the face-to-face interaction could possibly set a student apart from others, after a long day of meeting hundreds of potential employers, it is more likely that he or she just become another name in a pile of resumes the recruiters have at the end of the day. 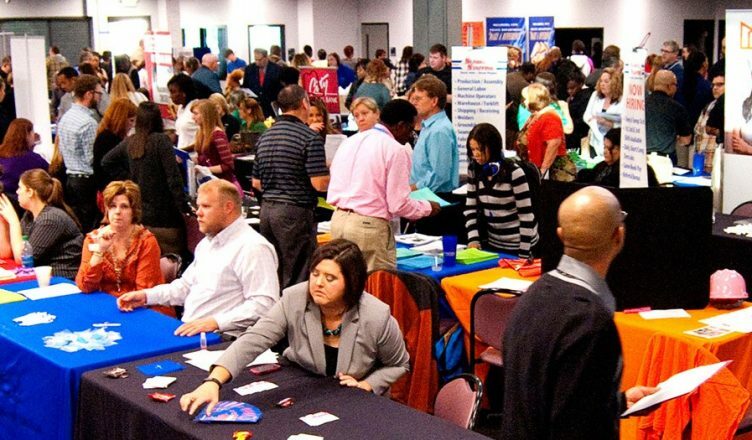 The sheer turnout of the events only makes finding a job that much harder: many times, industries come to career fairs with only a handful of employment opportunities to offer, and with the number of students milling about, recruiters can speak to anywhere from 100 to 300 students. From that point on, it is very difficult, unless the student has created his or her own best-selling application or cured cancer, to set oneself apart from a resume standpoint, particularly when a recruiter is paging through them following the event. In many instances, career fairs serve to benefit the university, as they allow connections with industry through the university’s ability to offer companies the next generation of employees and supplement the workforce. For example, UCSD began supplying engineering graduates to Qualcomm nearly three decades ago and from there allowed the company to utilize the UCSD Extension program to train workers in their technology. In return, the company’s CEO, Irwin Jacobs, donated nearly $110 million to the campus, and another $30 million in scholarships and grants. Companies at career fairs offer a slim amount of jobs to students but endless opportunities for funding to the university at which they recruit. Career fairs, although a tedious method of job-searching, do provide a valuable opportunity for students to receive feedback on one’s resume and learn more about industry professionals and their expectations — but at what cost? The fairs often lead to no payoff for the average student, who usually just gets pointed in the direction of the online application, and can be a large waste of time. In order to make the events more effective and useful for the students, the career services office must hold resume development and elevator pitch workshops prior to and geared toward the specific career fair, and even offer pointers and talks on online recruitment and how to navigate networking platforms like LinkedIn or Glassdoor. In order to incentivize these events, it would benefit early arrivals and dedicated individuals to enforce a cap on career fair attendance, preventing recruiters from being overwhelmed by an influx of students and giving those individuals a greater chance of being recognized for their commitment. In today’s tech-focused society, it is imperative that the way we approach employment after graduation changes in order to benefit students and prepare them for professional success.